The culture of Afghanistan has persisted for over three millennia, tracing record to at least the time of the Achaemenid Empire in 500 BCE. Afghanistan translates to "Land of the Afghans" or "Place of Afghans" in the nation's official languages, Pashto and Dari. It is mostly a tribal society with different regions of the country having its own subculture. Nearly all Afghans follow Islamic traditions, celebrate the same holidays, dress the same, consume the same food, listen to the same music and are multi-lingual to a certain extent. In the southern and eastern region, as well as western Pakistan which was historically part of Afghanistan, the Pashtuns live according to the Pashtun culture by following Pashtunwali (meaning "the way of the Pashtuns"). The western, northern, and central regions of Afghanistan are influenced by neighboring Central Asian and Persian cultures. Some of the non-Pashtuns who live in close proximity with Pashtuns have adopted Pashtunwali in a process called Pashtunization (or Afghanization) while some Pashtuns and others become Persianized. Women painting at the Center for Contemporary Arts Afghanistan (CCAA) in Kabul. The lands of Afghanistan have a long history of art, with the world's earliest known usage of oil painting found in cave murals in the country. A notable art style that developed in Afghanistan and eastern Pakistan is Gandhara art, produced by a fusion of Greco-Roman art and Buddhist art between the 1st and 7th centuries CE. Later eras saw increased use of the Persian miniature style, with Kamaleddin Behzad of Herat being one of the most notable miniature artists of the Timurid and early Safavid periods. Since the 1900s, the nation began to use Western techniques in art. Abdul Ghafoor Breshna was a prominent Afghan painter and sketch artist from Kabul during the 20th century. Afghanistan's art was originally almost entirely done by men, but recently women are entering the arts programs at Kabul University. Art is largely centered at the National Museum of Afghanistan, the National Gallery of Afghanistan and the National Archives of Afghanistan in Kabul. There are a number of art schools in the country. The Center for Contemporary Arts Afghanistan (CCAA) in Kabul provides young people to learn contemporary paintings. Afghan musicians in Farah, Afghanistan. Traditionally, only women have been involved in theater acting. Recently, in theater arts, women have begun to take center stage. Other known forms of art in the country are music, poetry, and several sports. The art of making carpets has been prominent for centuries. Afghanistan is known for making beautiful oriental rugs. The Afghan carpet has certain prints that make them unique to Afghanistan. Since the 1980s, the nation has witnessed several wars so music has been suppressed and recording for outsiders minimal. During the 1990s, the Taliban government banned instrumental music and much public music-making. Many musicians and singers continued to play their trade in the cities of other countries. Pakistani cities such as Peshawar, Karachi and Islamabad are important centers for the distribution of Afghan music. Kabul has long been the regional cultural capital, but outsiders have tended to focus on the cities of Herat and Mazar-i-Sharif with its Qataghani style. Lyrics across the country are typically in both Dari-Persian and Pashto. Hindi songs from Bollywood films are also very popular in Afghanistan. Afghan men performing at the new Afghan Cultural Center on Camp Leatherneck in Helmand Province. Poetry in Afghanistan has long been a cultural tradition and passion. It is mainly in Persian/Dari and Pashto languages, although in modern times it is also becoming more recognized in Afghanistan's other languages. Classic Persian and Pashto poetry plays an important role in the Afghan culture. Poetry has always been one of the major educational pillars in the region, to the level that it has integrated itself into culture. Some notable poets include Khushal Khan Khattak, Rahman Baba, Massoud Nawabi, Nazo Tokhi, Ahmad Shah Durrani, and Ghulam Muhammad Tarzi. Some of the famous Persian poets and authors from the 10th to 15th centuries are Rumi, Rabi'a Balkhi, Khwaja Abdullah Ansari, Jami, Alisher Navoi, Sanai, Abu Mansur Daqiqi, Farrukhi Sistani, Unsuri, and Anvari. Contemporary Persian language poets and writers include Khalilullah Khalili and Sufi Ashqari. Afghans universally prize wit and cleverness in speech. They use proverbs in their daily conversations far more often than Westerners do, and with far greater effect. An appropriate Afghan proverb inserted at the right time can carry the weight of an entire explanation or discussion. An Afghan proverb used well, especially by a foreigner, leads most Afghans either to laugh in genuine surprise and delight, or to nod thoughtfully while considering its full meaning and nuance. "Zarbul Masalha" (pronounced zar-bull mah-sal-HAA) means "Proverbs" in Dari, and these zarbul masalha deeply reflect Afghan culture. Although often humble in origin, Afghan proverbs can rival the great words of famous philosophers and writers throughout world history in their richness, meaning and color. A good Dari proverb, properly used, can match the wisdom of Confucius, the depth of Zen Koan, the whimsy of Lewis Carroll, the homespun words of Mark Twain, and the lyricism of Shakespeare - all in one short, meaningful phrase. Above all, the proper use of Afghan proverbs demonstrates respect and understanding of Afghan culture at a very high level. Their use can lead to deeper personal connections that in turn help bridge very different religions, ethnicities, customs and traditions. Regardless of their many differences, people all over the world share many common feelings, opinions and hopes. Afghan proverbs highlight these similarities, and show our common humanity. U.S. Navy Captain Edward Zellem pioneered the use of Afghan proverbs as a positive relationship-building tool during the war in Afghanistan, and in 2012 he published two bilingual collections of Afghan proverbs in Dari and English. The region has made major contributions to the world's architecture. UNESCO has acknowledged Afghanistan's role by declaring the Minaret of Jam and the Valley of Bamiyan, home of the famous Buddhas destroyed by the Taliban, World Heritage Sites. Other examples of important contributions to architecture may be found in Herat, Mazar-I-Sharif, Ghazni Kandahar, and Firuzkoh in Ghor Province. Some of the popular Afghan dishes, from left to right: 1. Lamb grilled kebab (seekh kabab); 2. Palao and salad; 3. Tandoori chicken; and 4. Mantu (dumplings). 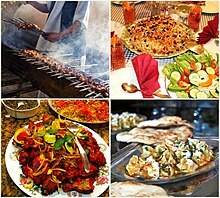 The Afghan cuisine includes a blend of Central Asian, Eastern Asian, South Asian and the Middle Eastern cuisines. Nearly all Afghan dishes are non-spicy. The sports in Afghanistan are organized by the Afghan Sports Federation, which promotes football, cricket, basketball, volleyball, golf, handball, boxing, taekwondo, track and field, bowling, skating and several others. Cricket and football are the most popular sports in Afghanistan. The Afghanistan national cricket team, which was formed in 2001, has held matches against all other international cricket teams. The Afghan team rapidly rose through the World Cricket League since early 2008. It participated in the 2009 ICC World Cup Qualifier, 2010 ICC World Cricket League Division One, and 2010 ICC World Twenty20 where they played India and South Africa. The team won four times in a row, the ACC Twenty20 Cup in 2007, 2009, 2011, and 2013. It played against top ranking teams in the 2012 ICC Under-19 Cricket World Cup and the 2012 ICC World Twenty20. In the national level, cricket matches are played between provinces, mainly between the south and eastern provinces of the country. In the other sports, Afghans usually play with challengers of neighboring states and sometimes with other Asian countries. The Afghanistan national football team was founded in 1922, joined FIFA in 1948 and the Asian Football Confederation (AFC) in 1954. Although it did not play in any international games from 1984 to 2003 due to the war, it is now striving and hoping to make it to FIFA. The Afghanistan women's national football team was formed in 2007. 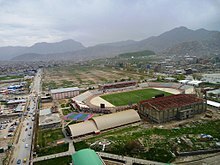 The Ghazi Stadium, which was built during the reign of King Amanullah Khan, was once used for a venue for public executions by the Taliban government. The stadium is currently used mostly for football matches between teams from different provinces of the country as well as neighboring countries. Basketball has existed in Afghanistan since at least the 1970s, and is slowly becoming popular again. It is played by both Afghan men and women. Additionally, Afghans in the north of the country enjoy the sport of buzkashi. Education in Afghanistan includes K-12 and higher education, which is supervised by the Ministry of Education and Ministry of Higher Education in Kabul, Afghanistan. There are about 10,000 schools of which 4,000 were built in the last decade. More than 100,000 teachers were trained and recruited in the same period. It was reported in 2011 that more than seven million male and female students were enrolled in schools. Some of the well known schools in Kabul are Habibia High School, Lycée Esteqlal, Amani High School, Aisha-i-Durani School, Ghazi High School and Rahman Baba High School. The Ahmad Shah Baba High School and Zarghuna Anna High School are two of the oldest schools in Kandahar. Since the country has one of the lowest literacy rates in the world, the United States began establishing a number of Lincoln learning centers to help with this problem and promote American culture in Afghanistan. They are set up to serve as programming platforms offering English language classes, library facilities, programming venues, Internet connectivity, educational and other counseling services. A goal of the program is to reach at least 4,000 Afghan citizens per month per location. The military and national police are now provided with mandatory literacy courses. In addition to this, Baghch-e-Simsim (based on the American Sesame Street) was launched in late 2011 to help Afghan children learn from preschool onward. Programs in the show "will be partly filmed in Afghanistan with the rest" lifted from other versions in Muslim countries including Egypt and Bangladesh, as well as Mexico and Russia. Higher education is provided by various universities throughout the country, which include the American University of Afghanistan, Kabul University, Polytechnical University of Kabul, Herat University, Balkh University, Nangarhar University, Kandahar University, Khost University, Bakhtar University, and a heap of others. There is also one military college, located in Kabul. Recently with help from UNESCO, over 1,000 women have taken the university entrance exam. As of 2011, about 62,000 students are enrolled in different universities around the country. Pashto and Dari are both the official languages of Afghanistan, although Dari (Afghan Persian) serves as the lingua franca for the majority. People in the northern and central areas of the country usually speak Persian/Dari, while those living in the south and east speak Pashto. Afghans living in the western regions of Afghanistan speak both Dari and Pashto. Most citizens are fluent in both languages, especially those living in major cities where the population is multi-ethnic. Several other languages are spoken in their own regions, which includes Uzbek, Turkmen and Balochi. English is gradually becoming popular among the young generation. There are smaller number of Afghans who can understand Russian, mainly among the northern Tajik, Uzbek and Turkmen groups. Men praying at the Blue Mosque (or Shrine of Hazrat Ali) in the northern Afghan city of Mazar-i-Sharif. Islam is the main religion of Afghanistan and over 99% of Afghans are Muslims. An estimated 84.7–90% of the population adhere to Sunni Islam, while an estimated 7–15% practice Shia Islam, and approximately 1% are followers of other religions. In addition to Muslims, there are thousands of Afghan Sikhs and Hindus living in the country. They are usually found in the major cities such as Kabul, Kandahar, Herat, Mazar-i-Sharif, Jalalabad, and Lashkar Gah. Houses in rural Afghanistan are traditionally made out of mud, and have a series of rooms located around a private rectangular courtyard where women and children play, cook and socialize. Married sons share the same house as their parents in most cases, although they have separate quarters. Afghan houses contain a special room where men socialize with each other known as a hujra. In the cities, many Afghans live in modern style houses or apartments. There are many new housing schemes being built in all the major cities of the country. Some of these include the $35 bn New Kabul City next to the capital, the Ghazi Amanullah Khan City near Jalalabad, and the Aino Mina in Kandahar. The nomadic kuchi people live in large tents because they are constantly on the move from one part of the country to another. President Hamid Karzai observing the honor guard of the Afghan armed forces during the 2011 Afghan Independence Day. Afghanistan's religious holidays are nearly the same as Islamic holidays. Some of the most important include Eid al-Fitr (end of Ramadan), Eid al-Adha, Ashura, and Mawlid. Religious minorities of Afghanistan, such as the Hindus, Sikhs, Zoroastrians, and others celebrate holidays unique to their respective religion. New Day, also known as Nauruz (Nowruz), is an ancient annual Afghan festival which celebrates both the beginning of spring and the New Year. The observances usually last two weeks, culminating on the first day of the Afghan New Year, March 21, and corresponds to the first day of the Persian Calendar. Nauruz is related to a religion called Zoroastrianism which was in practice in ancient Persia before the emergence of Islam. This festival is to celebrate the arrival of spring as plants, trees, and flowers start to bloom making the weather pleasant. On the day of Nauruz, families usually celebrate the festival by cooking food and going out for a picnic. Families cook various kinds of meals, Samanak, and Haft-mewah or dry fruits that start with the letter (س) or (S) which represents the arrival of spring season. Haft-mewah contains seven dry fruits which families place in warm water two to three days before Nauruz. Samanak is another type of dessert made from wheat and sugar. Women usually get together days before Nauruz to prepare Samanak. They pour the ingredients into a big pot placed on an open fire and take turns to stir the wheat and sugar in the pot before it turns into a thick paste. Once prepared, the dessert is then served on the day of Nauruz. ^ "Country Profile: Afghanistan" (PDF). Library of Congress Country Studies on Afghanistan. August 2008. Retrieved 2010-08-16. ^ a b c "Article Sixteen of the Constitution of Afghanistan". 2004. Retrieved June 13, 2012. From among the languages of Pashto, Dari, Uzbeki, Turkmani, Baluchi, Pashai, Nuristani, Pamiri (alsana), Arab and other languages spoken in the country, Pashto and Dari are the official languages of the state. 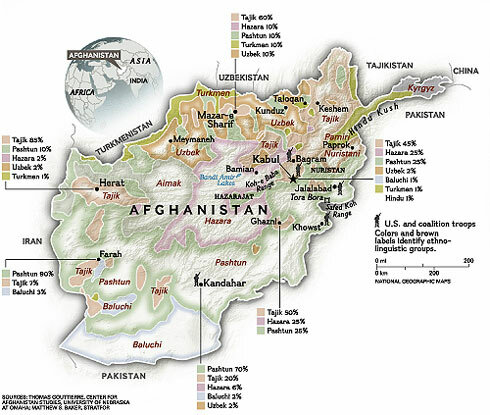 ^ "MAPS: AFGHANISTAN'S ETHNO-LINGUISTIC GROUPS". Institute For The Study Of War. Retrieved 2010-09-25. ^ "Map showing ethnolinguistics groups of Afghanistan". National Geographic Society. 2003. Retrieved 2010-09-25. ^ "First-ever oil paintings found in Afghanistan". CNN. April 24, 2008. Retrieved 2012-12-03. ^ "World's Oldest Oil Paintings Found in Afghanistan". Fox News. April 24, 2008. Retrieved 2012-12-03. ^ "Gandhara art". Britannica. Retrieved 2018-08-22. ^ "It's Bollywood all the way in Afghanistan". The Hindu. Archived from the original on 2009-10-16. Retrieved 2007-03-25. ^ Afghanmagazine.com – Ustad Khalilullah Khalili – 1997. ^ "Sports". Pajhwok Afghan News. Retrieved 2011-03-30. ^ a b c "Education". United States Agency for International Development (USAID). Archived from the original on September 2, 2011. Retrieved August 11, 2011. ^ Farmer, Ben (November 30, 2011). "Sesame Street to be broadcast in Afghanistan". Kabul: The Daily Telegraph. Retrieved December 5, 2011. ^ DeMott, Rick (December 1, 2011). "Sesame Street To Debut In Afghanistan". AWN News. Retrieved December 5, 2011. ^ "Afghanistan". The World Factbook. www.cia.gov. Retrieved 2017-05-17. ^ "Chapter 1: Religious Affiliation". The World's Muslims: Unity and Diversity. Pew Research Center's Religion & Public Life Project. August 9, 2012. Retrieved 4 September 2013. ^ "Afghanistan Online: Culture - Important holidays/occasions/festivities celebrated in Afghanistan". Archived from the original on 2005-03-07. Retrieved 2005-05-24. Wikimedia Commons has media related to Culture of Afghanistan. AfghanProverbs.com. Features Dari (Afghan Farsi) Proverbs of Afghanistan, known as "Zarbul Masalha"